How to merge lines every 3 rows in Notepad++? It's a 2500 rows file, so i wouldn't just ctrl+j it. You can find out which line ending you're using by examining the status bar at the bottom of the Notepad++ window. It will say "Dos\Windows", etc. 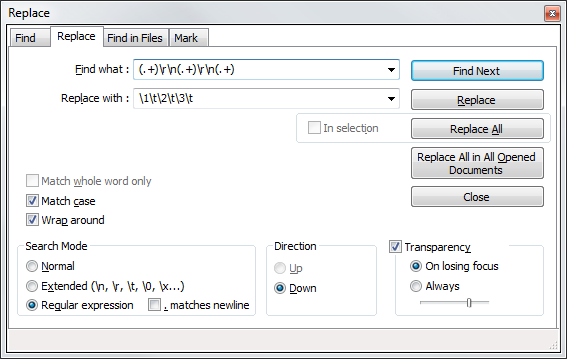 You can learn more about regular expressions here. This will replace all linebreak, not preceeded or followed by another line break, with a tabulation. Not the answer you're looking for? Browse other questions tagged notepad++ or ask your own question. In Notepad++ how can I execute a script (like using F5) but with every save (Ctrl + S)? How to select non contiguous lines of code in Notepad++? How to merge every second row in Notepad++?